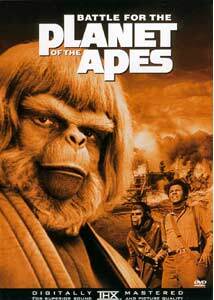 Aldo (Claude Akins): "When shall Ape kill Man?" Bob: "Well, certainly not in this film." Ugh. I can't recall ever having seen the fifth installment in the Planet of the Apes series, Battle for the Planet of the Apes, and I'm fairly glad for it as it would have tainted my entire viewing. I have been singing the praises all series (in my first four DVD reviews) of this phenomenal sci-fi series for having stuck to its guns despite attempted scuttling by Fox (at the time), but despite upholding the rich tradition of the series for nearly all of the film, in the end this degenerates to such a base level that the Politically Correct Marketing Suits might as well have written the ending. (So as not to play the spoiler, I am going to be somewhat cryptic in my argument here for those who haven't seen the series before.) While the previous four, and to this part the first 90%, upheld the timeline, general feel and continuity from film to film, this one behaves so badly I am left not only disappointed but befuddled now as well. Can anybody out there who has a better grasp on the series help me out with this? Was this ending to amicably roll forward into the TV series (which I watched religiously, but my long-term memory fails me from remembering anything significant)? I have a hard enough time with the strange implications (or lack thereof) caused by the timeline created by the goings on in films 3 (Escape) and 4 (Conquest), because there is no linear connection as to how the apes would have evolved had it not been for the events of 3 and 4—but at least the connection is interesting and somewhat logical (if not, perhaps, false logic). Now I'm left to wonder how in the Lawgiver's name we can move forward from the end of 5 to 1 (Planet of the Apes), without a sixth installment. I propose THIS is what Tim Burton should be creating—not rehashing what most definitely does NOT need to be remade. Or, if he wants, let Tim start by recreating the end of 5 with a less Annie like, golly-gee-willakers ending. Pishaw. All right, let's get to the majority of the film—which, while melodramatic, I do like! While not as strong as the other four films, after a several minute round up of films 3 and 4, Battle at least returns to the hinterlands of the post-apocalyptic apedom we know and love (nuclear war broke out following the uprising of the apes destroying existence as it was known). To define myself, I always despise it when Star Trek takes place on Earth, in any form, as I feel it cheapens the illusion. Battle also brings back the juxtaposition between light-hearted repartee and important philosophical conundrums resolved while the rest of the plot rolls by somewhat awkwardly, as narrated by The Lawgiver (Claude Akins), some 600 years after Caesar has passed on to Ape Heaven. The conquest then complete, Caesar (now king) is trying to grow ape society through the classroom (run under some duress by humans), while attempting to keep life amicable between apes and humans, a precarious peace at best. The gorillas, helmed by General Aldo, are beginning to smell blood, their rage focused upon the humans at the hands of whom they suffered a lifetime. For Aldo however, his lust for power goes beyond putting down or killing humans, he thirsts for control—even at the expense of Caesar's life. Meanwhile, Caesar enlists McDonald (Rhodes) and the sagastic orangutan, Virgil—Paul Williams' introduction—to join him on a trip back into the Forbidden City (we discover it is Caesar who has deemed New York "verboten"), seeking both a chance to hear his parents speak (via Breck's secret recordings of Zira's drunken ramblings from part 3), as well as the subsequent knowledge MacDonald believes they will discover about the future of the world. While in the archives of Ape Maintenance the trio discover some humans have survived, mostly mutated, and live underground, led by Kolp (Darden), now Governor. Kolp recognizes MacDonald and Caesar, and the chase is on! Mutant human scouts follow the retreating group back to Ape City, and seeing the agitated state of the gorillas led by Aldo, report back that the apes intend to wage war against the mutants, causing Kolp to send troops to attack the apes proactively. Are these the same beings who mutate later to become the highly evolved telepathic subterranean missile-worshipping dwellers from installment 2, Beneath? There is little evidence. Hard to believe this was the world's introduction to the diminutive actor, songster and Truman Capote look alike. Akins is wonderful as the meglomaniacal Arlo, and MacDowall is again superb in his second incarnation of Caesar. Image Transfer Review: This is a much darker transfer than the other 4, but is very good nonetheless. There are some scenes below ground that are so dark that facial detail is negligible. There is a linear aberration at approximately 16m. The opening scenes exhibit large grain, and scan lines are evident throughout, but after that, one should be pleasantly surprised again. Audio Transfer Review: This is a nice DS2.0 mix. The dialogue is driven predominately through the center speaker, but Rosenman's score well underscores the on-screen action, sometimes intimidating, scary or spine-tingling. There are a few pops here and there, but the worst comes when the surrounds unfortunately drown out much of the opening narration. Still, the nice front soundstage immerses one in the action, and it may not be until the film is over that you realize you only have a 2.0 mix. Extras Review: Thank goodness I get to move on to the 6th disc (which will be reviewed separately), as the supplements are few for this disc. Subtitling (below the image, in the lower black bar) is available in English and French. Trailers for all 5 films are again present. Another short cast list is given as well. B'dea, B'dea, B'dea, that's all folks! So, while I am annoyed by the soap opera-ish melodrama of this film, and the near ludicrous ending, it is still a fine treatise on the corruption of power; of how intelligence and knowledge are not always the same thing. How the basest of instincts are in every creature, human or ape. How hate—no matter how justified—begets violence, begets destruction. The apes tell us much about our society. Yet despite all these truthful reflections, the ending is nothing more than a hollow, superficial piece of fluffernutter. "Get your hands off my apes' series, you damn dirty marketing apes!"